Ferdinand Fox goes to Spain! 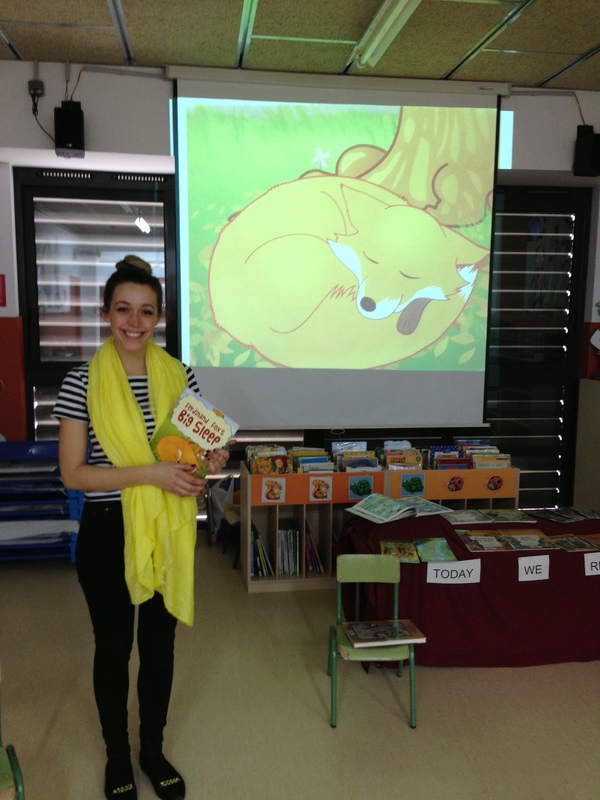 When I published my rhyming story picture book, Ferdinand Fox’s Big Sleep, last year I had no idea that within 12 months he would have found his way into a Spanish school! But that’s exactly what’s happened. Here I interview Amy Sandiford-Watts – the student behind this foxy tale! Thanks for contacting me to tell me you used Ferdinand Fox’s Big Sleep for one of your English teaching classes in Spain! I’m thrilled that he is now an international star 🙂 Many thanks for agreeing to a mini interview. Firstly, where in Spain is the school – and how long are you there for? It’s in a small town called La Ràpita – just over an hour from Barcelona. I arrived in September and I’m here for one academic year as part of the British Council language assistant scheme. I study French and Spanish at Durham university and a year abroad is part of my course. I work three days a week and help the English teacher with cultural activities and conversation practice. You mentioned that you’d used the book in several classes – what age are the children you introduced Ferdinand Fox to and how did it come about? 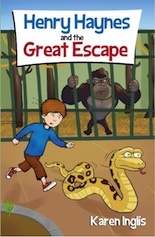 I read the story to mixed age groups of about 22 pupils from age three up to 11 years old. The activity was part of the school’s carnival celebrations when pupils spent a morning off-timetable celebrating ‘English Day’. The reading was one of 10 different 15-minute long sessions which gave them a chance to practise their English and learn something about England. Other activities included making a crazy hat for Royal Ascot and learning spells from Harry Potter! The children really enjoyed the story! The older ones understood almost every word, and the youngest could follow with the help of the pictures. Students of all ages liked shouting out which food Ferdinand dreamt about and talking about their favourite food. They also practised telling the time by shouting out the time when they saw the clock. Did they enjoy the rhyme? Children here first start learning English through songs and chants, so I think the rhyme was really useful and kept children interested even if they didn’t understand one or two words. I think being able to enjoy the story as a whole is more important than understanding every word, and it was a lot more fun than the stories they get in their English text books! The English teacher here has just done a storytelling course and praised Ferdinand Fox’s Big Sleep as being really good for this sort of activity, level and age group. How did you get hold of the book? Did you take a copy with you? No – I ordered it from Amazon and it came in under a week! I can see from the photos and video you sent that you had the images up on a large screen. How did you organise that? It was very easy to put the images on a big screen – I just took photos of the book and put them in a PowerPoint. I also used screenshots from the drag and drop matching game on Ferdinand Fox’s Big Sleep Book App to practise vocabulary after the story. You mentioned that there were regional visitors to the school that day who filmed the session – can you say a bit more about that? 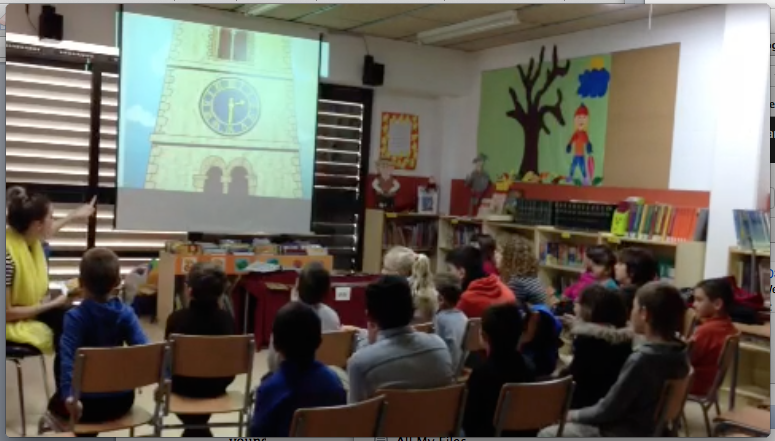 The school’s English Day was being filmed by Catalonia’s education department as an example of English teaching in the region, so the camera crew came along to film Ferdinand Fox too. The district’s foreign languages coordinator, who is in charge of English teaching in all the district’s schools, watched the session, and said thought it went really well. I’d like to extend a huge thanks to Amy for making Ferdinand Fox an international star! And for sharing her photos with me. I used to teach English as a foreign language many years ago and can clearly see how rhyming stories can add fun to language learning. This entry was posted in Picture Books and tagged picture books, rhyming stories, Spain, teaching English, TEFL. Bookmark the permalink.